These free webinars provide the EMS community with a unique opportunity to learn more about Federal EMS efforts and programs. Together with our Federal partners, the NHTSA Office of EMS will address issues important to the EMS community and share the latest news and information about federal resources and programs. Improving the safety of patients, providers and the public is likely a mission of every EMS agency and leader. While the EMS community has widely accepted the role of evidence-based guidelines in clinical care, many organizations have yet to adopt operational evidence-based guidelines to create a safer EMS system. Lights and Siren Use by Emergency Medical Services(EMS): Above All Do No Harm is one of the most thorough investigations of the topic ever published. EMS physician, paramedic and Pennsylvania Medical Director Douglas Kupas, MD, led the project and shares the impact of emergency lights and siren on response time and transportation time, safety and patient outcomes. Paramedic and researcher Daniel Patterson, PhD, reviewed nearly 40,000 published research articles as part of the Fatigue in EMS initiative, and shares the research, literature and findings on workforce fatigue for EMS and other high-risk occupations. He also reveals what EMS agencies can do to reduce the impact of fatigue on the safety of the workforce, patients and the public. Trauma remains a leading cause of death in the United States despite advances in prehospital and in-hospital care over the last half-century. In 2016, the National Academies of Science, Engineering and Medicine (NASEM) released A National Trauma Care System: Integrating Military and Civilian Trauma Systems to Achieve Zero Preventable Deaths After Injury, which proposed a vision for a national trauma system that would reduce deaths from injury on highways, on the battlefield and in any setting. The panel discusses the findings of the NASEM report and the role of EMS in achieving its vision, the results of a collaborative conference held in April to discuss implementation of the report’s recommendations, the role of the military in the nation’s trauma systems and how EMS systems can use data to measure and improve care for trauma victims. For more than a decade, individuals have served on the National EMS Advisory Council (NEMSAC) representing diverse stakeholders within the EMS community and advising the U.S. government on important national issues affecting EMS. The council has worked to elevate the profession through open and thoughtful discussion and recommendations on topics ranging from an EMS culture of safety to the educational system, and data collection to community paramedicine. In this webinar, the panel discusses NEMSAC’s most impactful recommendations to date, innovations in EMS that have come as a direct result of NEMSAC’s recommendations, and why EMS community leaders should apply to serve on the council. A day in the life of an EMS practitioner carries the risk of injury or illness. In fact, data show that EMS workers experience a higher rate of work-related injuries than the general workforce. These injuries jeopardize their careers and also put a strain on the profession due to lost productivity and high turnover. This webinar discusses a national study of EMS workforce safety led by the National Institute for Occupational Safety and Health (NIOSH). You’ll hear about both local and national efforts to improve EMS workplace safety and reduce injuries. Establishing data connections between EMS, hospitals and other healthcare organizations could greatly improve patient care by allowing EMS providers to view a patient’s past medical history and by providing hospital staff with more accurate and accessible information about what EMS saw and did in the field. Earlier this year, the Centers for Medicare & Medicaid Services (CMS) published a guidance letter that allows the use of Health Information Technology for Economics and Clinical Health (HITECH) funds for expenditures related to electronically connecting eligible providers to other Medicaid providers, including EMS, to share health information. Learn more about the HITECH Act and the implications of the CMS guidance letter, how to leverage Medicaid HITECH funding and what EMS activities may be eligible for those funds. The United States is in the midst of an opioid overdose epidemic, affecting families and communities across the nation every day. EMS is often the first to arrive on the scene of an overdose, which gives providers an important responsibility in providing timely, appropriate care – but also presents EMS with opportunities to provide valuable information to public health and other partners and to play a role in preventing overdoses before they occur. Learn about national efforts to address the opioid overdose crisis, and how New Hampshire is piloting an EMS referral program for substance abuse patients and using EMS data to identify overdose hot spots. You’ll also hear how New Orleans EMS is partnering with public health agencies to track overdoses and educate the public on naloxone and much more. The authors of the 1996 EMS Agenda for the Future and EMSC lead a discussion of what lies ahead for EMS. This webinar kicks off by looking back at some of the profession’s most significant accomplishments over the last two decades, followed by a conversation about how the industry can evolve over the next 30 years. Don’t miss this opportunity to learn how associations, agencies and individuals can provide input in the planning process for the 2017 anticipated revision of the Agenda for the Future. 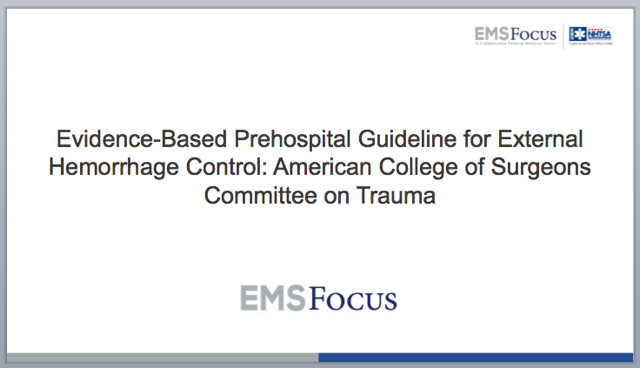 Hear why local EMS systems should embrace evidence-based guidelines (EBGs) and tips for how to implement them. This webinar features a distinguished panel of speakers who will discuss how EBGs are changing EMS and improving patient care, the challenges of educating providers on EBGs at the state and local levels, and gaining buy-in for the guidelines and incorporating them into EMS practice. Learn about the Blue Campaign, the Department of Homeland Security's effort to end human trafficking. You'll hear from a former prosecutor of human trafficking cases and Homeland Security officials, who will describe how to recognize potential victims and what steps EMS providers should take on the scene. Leading experts discuss the impact that technological innovations will have in improving patient care, operations and collaboration among providers. Hear insight from the authors of the recently released Emerging Digital Technologies in EMS: Considerations and Strategies to Strengthen the Continuum of Care and a professor of pediatric critical care in a children's research hospital about the innovative ways that prehospital care can be improved with new technologies, including digital data, medical devices and software applications. Data collection and use continues to be an important topic within EMS, across agencies and systems, at the local, state and national level. The July webinar will feature a roundtable discussion to address how EMS systems use data to benchmark performance and guide quality improvement efforts to provide better care for patients and communities. NHTSA regularly investigates ambulance crashes, with detailed reports that reveal valuable information about ambulance crashes and safety across the U.S. Learn how NHTSA's Office of EMS is collaborating with a variety of partners to use this information and other data to improve the safety of all providers and patients in transit. FirstNet Board members will explain why the FirstNet effort to build a nationwide public safety broadband network is important to EMS systems across the nation and provide an overview of current FirstNet activities, including consultations with the public safety community. National experts in emergency medicine and trauma care join the Office of EMS to discuss lessons learned from Iraq and Afghanistan, how prehospital tourniquet application is saving lives, the guideline development process and suggestions for guideline implementation. Scott Youngquist, MD, MS - Salt Lake City Fire Dept. Take a detailed look into the top four priorities of the FICEMS Strategic Plan released in 2014. Addressed in this webinar: Veteran to Civilian EMS Credentialing, Evidence-Based Guideline Development, EMS System Preparedness and EMS Data Standardization.